Honda employees have the opportunity to work on racing engines. The Chevrolets and Hondas that millions of Americans drive have at least one thing in common with the high-revving, single-seat open-wheeled cars that will be zipping around the track during next Sunday's running of the Indianapolis 500. That would be the engineers who develop the cars. Chevrolet and Honda both offer engineers jobs working in their company's racing operations. Some of the same elements that are crucial to winning on the track -- slippery aerodynamics, reliability and fuel economy -- carry over to production vehicles and vice versa. Chevrolet engineers who have worked on the company's race cars have gone on to help create and test such street-legal production vehicles as Cadillac's V-series performance cars, the track-ready Chevrolet Camaro Z/28 and the Chevrolet Cor-vette Z06, the fastest production Corvette ever. "We actually transfer people into the racing program and then back into production development," Dave Leone, Cadillac chief engineer, said during the recent introduction of the Cadillac ATS-V.
Honda operates a separate business in Santa Clarita, Calif., called Honda Performance Development. About 150 engineers work there designing, building and testing race engines, suspension systems and prototype parts, some of which will be used Sunday, May 24, at Indianapolis. "It's a way to bring in associates from all over the company," said Lee Niffenegger, a senior engineer for commercial motorsports at Honda Performance Development. Niffenegger has worked on both sides of Honda's business, spending his first 13 years in r&d, where he helped engineer production cars such as the 2006 Honda Civic Si, the performance model of the Civic line. He says reducing weight is one area where engineers working on race cars can transfer their knowledge to production vehicles. "It benefits everything -- braking, acceleration, stop-and-go turning, fuel economy. In racing, you can attack weight by spending money using more exotic materials. That is starting to trickle down from racing as you learn more and as suppliers get the costs down." At Honda, jobs at Honda Performance Development are posted internally, and any Honda associate can apply, said Niffenegger. At Chevy, engineers can apply for jobs on a number of racing projects. Chevy spokesman Monte Doran also says if an engineer has a special skill, he or she may be offered a transfer to racing for three years or until a project is completed. At this year's Indy 500, all of the race cars will be powered by either a Chevrolet or a Honda engine. These high-revving, 2.2-liter, V-6 engines run on E85 fuel -- same as what consumers can buy at the pump -- and feature direct fuel injection and turbochargers, two more technologies common on today's production vehicles. The Indy engines rev to a dizzying 12,000 rpm and are rated at between 500 and 700 hp. All of the Honda engines were built at Honda Performance Development. Chris Berube, Chevrolet's IndyCar program manager, has worked on the IndyCar program since 2012. Before that, he spent 27 years in various engineering positions at General Motors. He says working in racing is like launching a new car every week. "From an engineer's perspective, the thing that will come up first is the pace of things in the motorsports world," Berube said. "We race every weekend, and we find problems that need fixing by the next practice session or by the next race weekend. You've got results that are visible. You learn and prepare to be able solve problems very quickly." Engineers working on racing vehicles also spend time driving on the track and learning how to tweak powertrains, chassis and brakes for optimum performance. "We take many of the requirements for track capability right into the development process. And we use much of the same instrumentation as you find in motorsports cars," Berube said. "It's very much a data-driven process." So far this year, five of the 16 races of the IndyCar season have been completed. 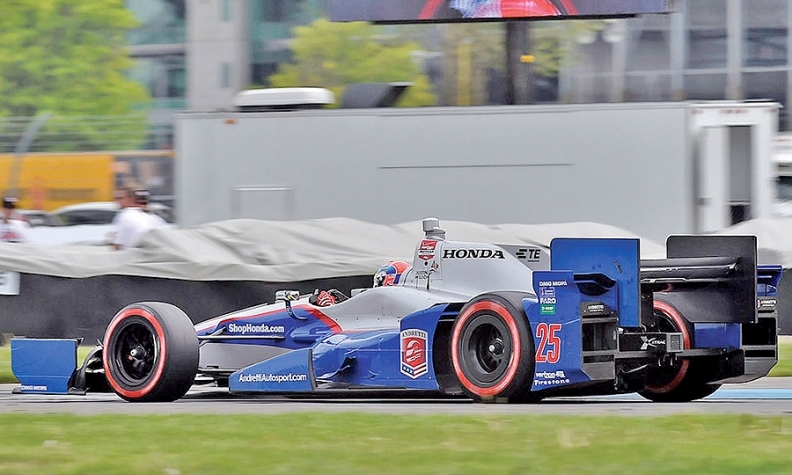 Chevy-powered cars have won four races to Honda's one victory.